So you’ve bought yourself a new digital single lens reflex camera (DSLR) and you have been shooting everything that moves and doesn’t move but your images are still not right. Why you ask yourself is this the case? Well it could be a number of things really, exposure, light, shutter speed, subject or vibration. You can read all the books you want or attend all the workshops you can but until you actually experiment and learn from your experiments you will not fully grasp the beautiful world of photography. Experience is your best friend and practice makes perfect as the old adage states. So grab your camera and tripod and get out there and take photographs. Lots of photographs! The beauty of digital photography is there is no cost for developing your images onto a print so the sky (memory card) is the limit. If you are someone who needs to, then take meticulous notes to browse at later date when viewing the image to understand the implications of your different settings, positions and subjects. Here are five exercises that should help you to improve your style and technique when shooting images with your camera. Try these simple lessons over a period of one week or more depending on your motivation or time available and you should see an improvement in your photography skills. Don’t forget to leave a day or some time in the evening to go over your photos to learn what the exercise has taught you. These lessons also are making the assumption that you know a little about how to use your camera’s exposure settings but if you are a newbie then just set your camera to auto and you should also be able to learn a thing or two from them. If you are a beginner and have the time you could do the exercises all over again this time turning off your auto exposure and using different exposure settings on your camera. Then compare the two projects to get a better understanding of your camera. Light is the single most important element of photography. You cannot take pictures without it. The basic principle of photography is capturing light. All digital cameras are developed with this in mind and control the amount of light hitting the sensor. So by practising how you actually see the light in your composition will enable you to instinctively take better photos in the future. The best time of the day for light is the morning and evening so get up early and stay out late to fully take advantage of this exercise. But to learn properly don’t forget to take some shots during the middle of the day also to understand what harsh light can do to your image. All right lets get started by packing your camera, a medium length zoom lens, a nice wide angle lens (unless your zoom covers this) and your tripod. Pick a spot where you feel comfortable and if necessary your family can also enjoy the day without distracting you from the task at hand. Look for different types of light, like rays shining through the trees, colours of light (especially first thing in the morning and towards the twilight of the evening), reflections of light, different angles of light, how light is creating shadows, any light that looks interesting to you. Try both lens ranges from wide to telephoto to see how the light will change. Remember it is the light you are shooting not a subject. This will help you to see the light first and subject second to improve your ability to take awesome shots by instinctively seeing how the light affects the subject in your composition. Composition is another very important aspect of what constitutes a good image. Here is another article I wrote on composition. In this exercise I want you to focus on where you will place your main subject in the frame. Throughout the course of the day pick a subject and start by shooting it dead centre and then moving it around the frame. Top right, bottom right, top left, bottom left etc. The objective here is to see how the placement of your subject can influence the overall composition of the image. Humans usually see from left to right, by simple placing your subject in one of the quadrants mentioned above will alter the direction their eyes will follow and make for a more pleasing image. The rule is to avoid placing your subject in the centre so compare the images to the centred ones to help understand why. There are of course exceptions to this rule. Next take a series of photos with two subjects this time and try to balance the weight of the two by placing your main subject offset from the secondary subject. And for the last part of this exercise, look at the background of your subject(s) and try to take photos with single coloured backgrounds or similar coloured backgrounds then a few of backgrounds with various colours so you can see the difference between the two. Flowers work well for these exercises but any subject(s) will suffice. When using animals or humans for your subjects, remember to position them so they are looking inside or towards the centre of the frame instead of away for a better composition. The world is surrounded by colour. It is usually taken for granted by all photographers at some point in their careers. Those that go on to take great images learn to use colour to evoke emotions that every human being feels when viewing certain colours. For instance, colours in the warm spectrum are reds, yellows and oranges which can influence feelings of comfort, warmth and also feelings of anger and hostility. The other end of the spectrum are the cool colours like blues, greens and purples. They evoke feelings of calm, relaxation or even apathy and sadness. 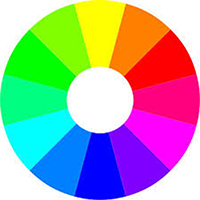 The colour wheel to the left shows how the colours are in relation to each other in the spectrum. The closer the colours are together the more they compliment each other and the further apart the more they contrast each other. Bear in mind that different cultures have various meanings for colours that may also influence how your image is perceived. Overall learning to use colours effectively requires that you learn how they look together and apart from one another in your composition. So grab your camera, lenses and tripod once again and head to your favourite colourful spot where you live and start shooting colours. Just focus on the colours not the subject(s). Look for colours that compliment each other and colours that contrast each other. Use different lenses to see how focal lengths can affect the colours. Notice how the colours also change with the time of the day or how they look in the shadows as opposed to direct sunlight. What about reflections? How do the colours differ between the reflection and actual subject reflected? What about a close up of a flower or insect? How do the colours differ between the normal size and close up sizes? Once you start to understand colours you will take much better photos. Most beginning photographers take their images at eye level far too frequently. By changing the viewpoint when composing your photo you can capture a different feel for your subject(s) than would normally be evoked at eye level. Even something as simple as taking a vertical shot instead of a horizontal shot can alter the emotional impact a photo will have on its viewer. In this exercise I want you to find your subject of choice and take multiple shots of it from different angles, heights and views. Take about 5-10 images of each subject you find during the course of the day. Try things like sitting on your bum placing your elbows on your knees for stability, lowering your tripod to its lowest level, shooting your subject at a 45 degree angle, lying flat on your stomach, lying flat on your back, climbing a rock or tree stump and shooting down on your subject, from your balcony, the ideas are endless. Be careful if climbing something to get a higher advantage as we want to live to shoot another day right! Now that you have finished all the exercises I’ve asked you to do, it’s time to put it all together in one complete exercise that should allow you to use all the techniques you’ve learned previously. I’m going to break this down into two exercises actually, one where you will only hand hold your camera and one where you will only use your tripod. By doing this you will also see a big difference in the quality of your images. So spend one day without your tripod and one day with it. Pack your camera, lenses and tripod (second day) into your bag and head to a nearby spot where you know there is an opportunity to use all the lessons learned in the previous exercises. My favourite spots are beaches, lakes, and parks where there is an endless supply of subjects, different light, many colours and items or props to use for perspective. Pay attention to the light. Which direction is it coming from? How intense is it? Can the background or foreground be used to filter the light? What about shadows? If early morning or late afternoon will waiting a bit deepen or change the colour of the light? Look for subject(s) that the light enhances or illuminates. Think about where you will place your subject(s) in the composition that will draw the viewer to it. Will the background distract or add to the subject? Is your subject an animal or person? If so, are they looking towards the centre or inside of your frame? Is there a horizon? If so, is it positioned properly and level? Look for colours that make your subject(s) stand out or blend in to or from the background. How do the colours compliment each other? Are the colours warm in nature or cool? What emotions will they evoke? What about the viewpoint? Would the subject look better from a different angle or height? Should my frame be horizontal or vertical? Once you get through all 5 of the exercises presented here you will be on your way to taking better photos and have a greater understanding of the camera you use. You should also be able to apply these lessons to help develop your style in photography. Hope you enjoyed these projects and they weren’t too overwhelming and most important of all get out there and have fun! !